The 17th Appalachian and Bluegrass Music Festival at the Ulster American Folk Park, Omagh, Co. Tyrone, Northern Ireland, will be held from Friday 5 September to Sunday 7 September 2008. The programme features nine bands from North America, headed by Michael Cleveland & Flamekeeper and Danny Paisley & the Southern Grass; three leading bands from continental Europe - the G2 Bluegrass Band (Sweden), the Blue Grass Boogiemen (NL), and Jiri Kralik & the Rowdy Rascals (CZ); and six bands from Ireland and the UK. Full details are on the festival website. Multi-instrumental old-time musician Bruce Molsky will be performing in Europe during the coming October and November. Beginning on 7 October, he will play twelve dates in England, Wales, and Scotland, and on 3 November he will begin a series of fifteen dates in Sweden. Full details are on the Bruce Molsky website. Yesterday 30th July, the third edition of the Festival Européen de Bluegrass Music started in the charming medieval village La Roche-sur-Foron in the French Alps. 22h15 - Concert événement avec le groupe américain "3 Fox Drive"
23h - Concert événement avec le vainqueur de l'édition 2007 , le groupe tchèque "Kralik & Rowdy Rascals"
20h30 - Concert événement avec le coup de coeur de l'édition 2006, le groupe italien "Mideando String Quintet"
Liz Meyer reports that Larry Roberts, presenter of 'Down Home' on The Globe Radio, 91.1-FM, Goshen, Indiana, devoted the whole of his two-hour programme on Tuesday 29 July to the Strictly Country Records double CD 10 years of European World of Bluegrass, broadcast at 7.00-9.00 p.m. EST (1.00-3.00 a.m. Western Europe Time). Peter Thompson of San Francisco, California, presenter of the 'Bluegrass Signal' show, will repeat his one-hour 10 years of European World of Bluegrass CD feature every day next week (3-8 August) on WAMU's Bluegrass Country radio, which can be heard here. Full times of broadcast, quotes from reviews, and more details are in Liz's complete release, which can be read here. Thanks to the Bluegrass Blog for the news that Richard Ciferský of Slovakia, formerly a member of Fragment (2002-5) and now with Waterflow, is also leading his own band, Richard Ciferský & Rainy Day, named for the title track of his new solo CD, which was released on 15 July. Eight of the ten tracks are original compositions by Richard Ciferský (banjo); the rest of the band are Linda Nováková (flute), René Jankovič (guitar), Richard Molnár (bass), and Adam Jánoš (drums). Guest musicians on the CD include Becky Buller (fiddle, vocals), Emil Formánek (guitar), Roman Sýkora (bass), Michal Barok (mandolin), Peter Szabados (dobro, pedal steel), Sisa Michalidesová (whistle, flute), Peter Prelozník (piano, strings), and Luboš Jurkovič (vocals), drawn from bands including Druha Trava, Meantime, and Waterflow. The tracks 'Rainy day' and 'Blue Nashville' are available (complete tracks) as free mp3s on Richard Ciferský's website. Solo, the new solo CD by English multi-instrumentalist Johnny Butten, was announced at the beginning of July on the European Bluegrass Blog. It is now released and available on CD Baby. More info and sound samples are on the CD Baby page and on Johnny's MySpace site and website. Update 10 August: Johnny Butten appeared on the 'Blue Plate Special' show on WDVX from Knoxville, TN, on 8 August. Full details are on the Bluegrass Blog. Thanks to Roger Ryan of the Country Music Association of Ireland for news of a half-hour video on PTV Ireland, shot in June during a picking party at the Nashville home of Barry & Holly Tashian. The musicians there include Barry (vocal, guitar), Holly (vocal, guitar, bass), Roland White (mandolin, bass), and David Lege (guitar). In addition, Barry and Holly talk to Roger about their lives in music. Also present is Peter Wroblewski of Germany, president of the Country & Western Friends Koetz 1982 e.V..
Barry and Holly Tashian recently presented a three-day workshop on harmony singing at the Risør Bluegrassfestival, Norway (15-19 July). Roger Ryan took part in this year's IBMA Leadership Bluegrass course in Nashville. Thanks to Blue Highways TV for the news that the Carolina Chocolate Drops, the premier black old-time string band, and the Kruger Brothers, Switzerland's gift to the Carolinas, will be appearing on the WoodSongs Old-Time Radio Hour TV show on Friday 25 July at 7:00 p.m. EST. The show will subsequently be viewable on the WoodSongs archive. Thanks to Friedrich Hog for the news that the many American artists appearing at the 21st Festival Country Rendez-Vous at Craponne-sur-Arzon, France (25-27 July) will include the contemporary bluegrass bands Cadillac Sky and Three Fox Drive, as well as the neo-hillbilly Big Smith. As Friedrich will be at the Craponne festival, Peter Wroblewski will present the 'Americana' programme on Radio Free Ulm next Monday. 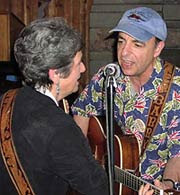 Cherryholmes, who won the IBMA Entertainer of the Year Award 2005, are about to play five shows in England and Wales (27-31 July), ending with the Cambridge Folk Festival. Full details are on the band's website. Jay Barron of InterNash Productions announces that Cherryholmes will return to Europe in February 2009. They are available for shows beginning 11-17 February, and are booked at the International Country Music Festival in Zurich (18/19 February), returning to Nashville on 20 February. Rob Ickes reports that Three Ring Circle (Rob Ickes, dobro; Andy Leftwich, mandolin; Dave Pomeroy, bass) will be performing in Lunel, France, as part of the Mandolines de Lunel 2008 festival. The festival will be held from Friday 30 October to Sunday 1 November. Rob Ickes has won the IBMA Dobro Player of the Year Award nine times since 1996. Anyone interested in a dobro workshop in France, which would be scheduled during the latter part of October, should contact Rob by e-mail. Saturday [at the Jamboree, Strakonice] started at 10.30 a.m. with Bluegrass Session #8 in the Castle yard. Czech bands Wejlet, Goodwill, Lunackove, Sunny Side, Minaret, Album, Wyrton, Petr Brandejs Band, then one of the Slovak bluegrass pioneer bands, Krok, CZ/USA Giant Mountain Boys, Rawhide from Belgium, and finally the Infamous Stringdusters gave the audience a sample of what they could expect in the evening... It was very hot and everybody was seeking for some shadow. The afternoon program started at 4 p.m. with the best of what the Czech scene can offer. The young band Kreni, Monogram, Eliska & Friends, Blue Gate, Blue Ground, Peter Kus & Famy, Druha Miza Vojty Zichy, Meantime (SK), Vabank Unit, and finally Rawhide from Belgium with their great show. Of course the highlight was the Infamous Stringdusters. They were touring Europe for five weeks, visiting five different countries, but that concert in Strakonice was for sure the best of the whole tour. Most people were just speechless; many of them - mostly musicians and even the MC from the stage - said the Stringdusters were the best band they’ve ever seen live in their life. Pure success pure! And the boys played and sang like gods! It was I think the first time on this festival without rain, there were showers and thunderstorms everywhere, but the bad weather did not dare to disturb the beautiful music. Sunday morning (1 June), my German friend Big Herbert, who was the driver for the whole tour, offered me a ride with them to Bratislava in Slovakia for their last concert. That night the band Meantime opened for them. The Infamous Stringdusters were so good, beyond all description, and everybody loved them. At the end they held a jam session with their Slovak friends Meantime. What a great conclusion of a fantastic tour. And what a great end to the most beautiful European Bluegrass Month of May. Since my first tour with VS&LP in 2002, I have had the pleasure to work with this professional high-class band. In musicianship and entertainment quality they can hold up with the best in the genre.They never leave the stage without enthusiastic calls for encores and standing ovations. Through their consistent returning to Europe they built a dedicated audience for themselves and were a strong force in helping to introduce bluegrass music as a musical form on a high level. Valerie Smith & Liberty Pike consists of lead singer and bandleader Valerie Smith, Becky Buller (vocal, fiddle, clawhammer banjo, guitar, and as a principal songwriter in the group), Bobby Davis (bass and fiddle), Chad Graves (resophonic guitar, vocals), and Eric Lambert (guitar, mandolin). We've had some exciting new internet-based developments at Flatpicking Guitar Magazine in the past few months and we would greatly appreciate it if you could let your members/readers know about these new opportunities that are available to them. Our new Flatpicking Network is a FREE on-line social network, like Facebook or MySpace, but just for flatpickers. On this site we post photos, mp3s, videos, blog news, flatpicking events, and our members can do the same on their very own individualised member home page! Members can also interact with other flatpickers, join various flatpicking interest groups, comment of various forum topics, access our podcasts, and much more. Check it out here. Flatpickdigital.com is our new digital download site where customers can sign up for a digital subscription to both the magazine and the audio CD, and they can also download all back issues and back-issue audio CDs. This option saves customers money, they get the magazine early, and it helps to save the environment by helping us greatly reduce our 'carbon footprint'! Check it out here. See also the EBB post of 13 July. The IBMA newsletter International Bluegrass reports that bluegrass performer, historian, teacher, and producer Peter Feldmann, born in Switzerland, received the Music Legend Award on 18 May from the Topanga Banjo/Fiddle Association of southern California. Home on the grange (Hen Cackle 505), the new CD by Peter Feldmann & the Very Lonesome Boys, was released on 16 May. Wells Fargo & the Nightingale wish you all a happy and beautiful summer full of bluegrass. For more info, visit the band's website or MySpace site. Hey, guys, you should open an account here at Flatpicking Guitar Network that Dan Miller created. Let us see European presence. You can accept Andrea's invitation through this link. Flatpicking Guitar Network, set up by Flatpicking Guitar magazine, is dedicated to presenting all aspects of the art of flatpicking the acoustic guitar. It already has 1,024 members, and carries 586 photos, 145 music tracks, 29 videos, 50 discussions, 58 events, and 46 blog posts. 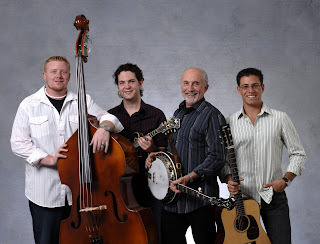 Gian Luca Naldi reports that Bononia Grass (Italy) has played the North Wales Bluegrass Music and Dance Festival in Conwy (UK) (see also Blog entry on 3rd July). "We enjoyed the Festival a lot. The location is amazing, Conwy is an ancient city in North Wales on an eastury with a beautiful castle and medieval walls all around. Weather has been good all three festival days just unusual for Wales region (God loves bluegrass people!). There we met The Special Consensus and Tom Hanway and we have had a great time with those guys. A special thank you to the festival promoters , John Les and Gill Williams , they are so lovely people an their love for Bluegrass music is so evident!!! was high and audience was warm and active. Just in three more days I was already heading to the Czech Republic to join Tony Trischka & Druha Trava on their tour. Tony’s last time in the Czech Republic was twelve years ago, in Prague for the fifth anniversary of Druha Trava. He came with the reunion of the band Breakfast Special in 1996. Their friendship began in 1988. Skyline played on their European tour, also the biggest Czechoslovakian festival Porta in Pilsen, in front of 30,000. Robert Krestan and Lubos Malina performed there with their former band Poutnici, and they became friends, since. Tony always has always been their hero and mentor. Tony can look back at his Czech roots, because his great-grandfather was born there. So after twelve long years he was now able to play in the Czech Republic again. They performed four concerts and two festivals between 23 and 30 May. From the first moment on their musician collaborations was just brilliant. After not even two hours of rehearsing they performed their first concert together. The excellent Grasscountry Drive band opened this little outdoor event for them and the area was filled up to the last seat. ‘Double Banjo’ with Lubos Malina worked out perfectly, and the rest of the band held their own. The audience was just enthusiastic. Next day we drove to Pilsen to Festival Lochotin after twenty years. The area was a large amphitheatre, the same as at Porta in 1988. Although it was very well visited, an audience of 30,000 will never ever be possible there again. But they received frenetic applause. On Sunday they played at a City festival in Teplice. This time Lubos Malina’s second band, Garcia, opened for them. This is a formation around incredible female singer Katka Garcia, playing mostly Celtic music. Also the Prague concert in Club Mlejn was sold out. Lot of people was standing along the walls. It was the longest concert on the tour and nobody would expect that the musicians rehearsed for the first time just four days ago. Many encores followed. So Tony showed us some solo work, double banjos, duet mandolin-banjo with Robert Krestan, and so on. One of the most beautiful was 'Esher’s waltz' with Lubos playing tarogato, a strange east European woodwind instrument. The next concert was in my hometown, Brno. Again hopelessly sold out. People standing everywhere and more than fifty were sent home from the box office. This year the Picnic Festival welcomes you again to the wonderful green place of Terra Nova at the Citadel of Namur on 6 & 7 September 2008. Saturday will stay the 'Bluegrass Day' with some great bands from Belgium, the Czech Republic, and USA like the Lovell Sisters (USA) (above), the Sacred Sounds Of Grass (D), G-runs ‘n Roses (CZ), and the Sons Of Navarone (B). We keep the Celtic music on Sunday with the great bands, David Munnelly Band, (Ir), Valerio (Ir, B), Turdus Philomelos (B), and the great show for kids, Les Déménageurs (B). Links to bands' websites are on our own website. All these bands will play on the outside main stage. Other great bands will play in a real 'Irish Pub' (Clo & Milo, Alain Baume & Marc Malempré (Celtic Tales), jams...). Another hall for food and a third one for some kids' entertainment (with musical instruments, toys in wood, games...). And of course stands with stringed-instrument makers, good regional food... and information about hearing troubles (more information on our own website). Our master words : a friendly, happy, and family-party people event! (entrance free under 14 years old, covered plain in case of rain). Presentation in French, Dutch and English. For more information, please visit our own website. and the Infamous Stringdusters (of whom more later), and finally the young Swedish G2 Bluegrass Band, voted in Holland as the #1 European Bluegrass Band 2007. The program could not be any better. Several hundred visitors to the sold-out event went home richer for a great musical experience. Thanks to the Bluegrass Blog for this news. A report on the tour is expected from Grasstowne on their return to the USA. Johnny Butten, English-born multi-instrumentalist now resident in the USA, will bring out his new swing-flavoured bluegrass album Solo in mid July. On it he plays all the instruments - banjo, upright bass, fiddle, mandolin, and guitar. Sample tracks can be heard on his MySpace page. Solo will be available through many online outlets, including CD Baby, iTunes, Napster and Amazon.com, and will be available for order through various stores worldwide. Also for release in mid July is the first of Johnny's Pick it right series - a beginner bluegrass banjo instructional DVD, including tablature booklet and onscreen graphics/chord charts never used in any previous banjo DVD. Other DVDs in the Pick it right series include Intermediate 1, 2, 3, and 4, advanced picking techniques, riffs and licks, speed picking, and a 1 hour DVD on banjo assembly and set-up with detailed video and graphics! These will be released throughout the summer and early fall. Johnny Butten remains the official last holder of the World's Fastest Banjo Player title, according to the Guinness organisation. However, Guinness are now revising the rules to allow more precise comparison between players, and a rematch between Johnny and the previous record holder is possible. Johnny's new band includes Joe Smart (guitar), a winner of the Winfield flatpicking competition, and Craig Mozley (bass); the position of mandolin player is still open. An article on Johnny and his activities is in preparation for High Plains Reader, a magazine covering the mid-western USA. Uli Singer announces that the 1. Bayerisches Bluegrass-Festival will take place on Saturday 19 July, starting at 18:00, at the Landkreis Starnberg, Weßlinger Straße 32/38, Baggersee in Gilching, Bavaria, Germany. Bands taking part include world-class banjo-player Rüdiger Helbig and his Huckleberry Five band; Strictly Bluegrass; and the BSB New Acoustic Band. Giovanni Stefanini and Martino Coppo can be seen jamming (with John Paul Jones on bass) on YouTube.